SUDOTECK released application HEX calc pro for iOS. This application enables mix mode calculation functions for Develop Engeneer . 1) Normaly you can use FLOATING value . 2) Automatically calculate to 64-bit HEX value. 3) Tap HEX indicator , you can enter the number as HEX mode. 4) Tap DEC indicator , youcan enter DEC or Floating value. 5) You can enter HEX , DEC , Float value on every calculation. Please comment this topic if you have any question . 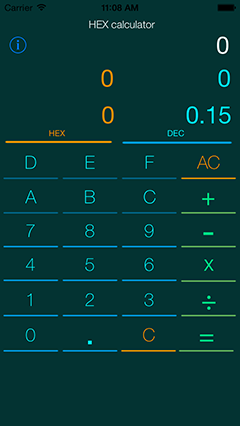 HEX calc pro looks like a great app! Is your app getting as many installs as you'd like it to? Getting app reviews for HEX calc pro on various app review blogs, is a great way to get your app noticed and get you MANY MORE INSTALLS! We work with over 100 app review websites - these sites review apps and can provide a great deal of traffic to your app. Over the years we have promoted hundreds of apps and networked and created contacts at all of the top app reviews websites. The reviews from other sites are great and can send a ton of direct traffic to your app BUT the additional value is in the fact that you are earning direct links to your app page. Links are the currency of the web and these links can increase your apps rankings in both the app store and where it your app appears in Google searches. Today we have an amazing offer- we'll submit your app to 155 iPhone App Review Sites on your behalf AND we'll also provide you with a full spreadsheet listing each website URL and contact details that we used for each one. (So you can reuse our resources for your future apps) AND we will also promote your app with a link on a Facebook profile that has over 4000 app review followers... The BONUS promotion of publishing your app to 4000 app review followers on Facebook is for a limited time.. you get this AND the 155 app review requests all within this package! Learn more today at the link below. Space is limited and this offer ends tomorrow! And please let me know if you have any questions about getting app reviews and more installs for HEX calc pro.